The year 2017 will go down as the year when fake news showed us its shape-shifting abilities. 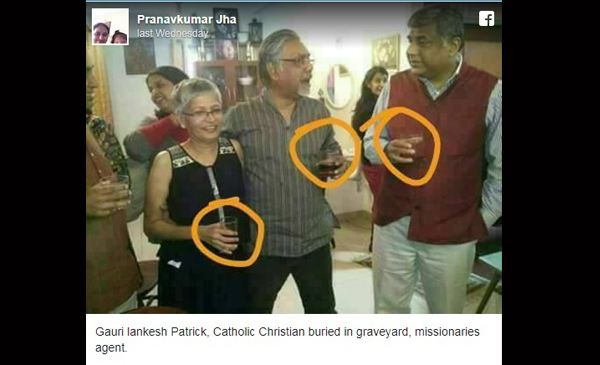 From water-cooler gossip and WhatsApp groups, fake news permeated into India’s biggest newsrooms and the echelons of foreign diplomacy. We bring you the top 10 biggest fake stories of 2017. 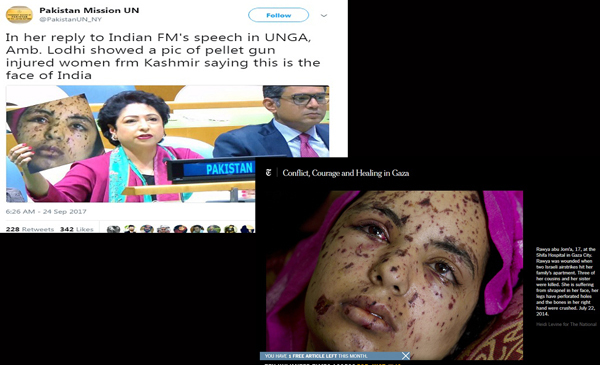 Pakistan’s United Nations envoy Maleeha Lodhi made an embarrassing gaffe when she tried to pass off a photograph of a girl wounded in an Israeli airstrike in Gaza as that of a Kashmiri youth wounded by a pellet gun fired by the Indian Army in Kashmir. The photograph by the award-winning American photographer Heidi Levine in Israel in 2014 has been featured in international media such as the Guardian and the New York Times. Click here to read the story. An image from the 2002 riots that took place in Gujarat was used in a ‘Save Bengal’ poster on social media to protest communal riots that rocked West Bengal’s North 24 Parganas district. The old image was also used on banners and placards at a rally staged at Jantar Mantar in Delhi on July 8th. Click here to read the story. News channel Times Now used an old and fake WhatsApp forward to substantiate a larger story about how Islamic terrorist group ISIS is converting Hindus in Kerala, raising serious questions about an editorial lapse in broadcasting a story with unverified information. Read the story here. 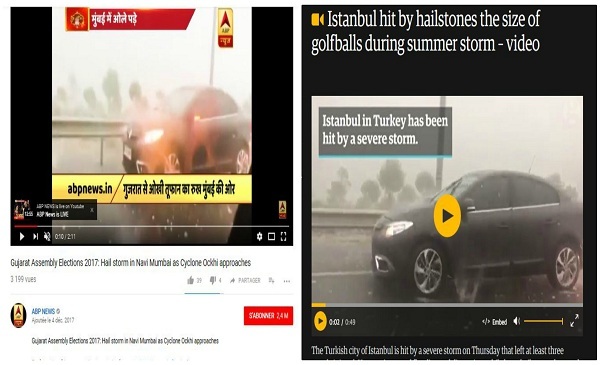 Several mainstream Indian news outlets including wires agency ANI and Hindi news channels ABP News and Zee News aired a video of hailstones pounding a road in Istanbul, Turkey and claimed it was the Mumbai-Pune Expressway in December. Click here to read the story. 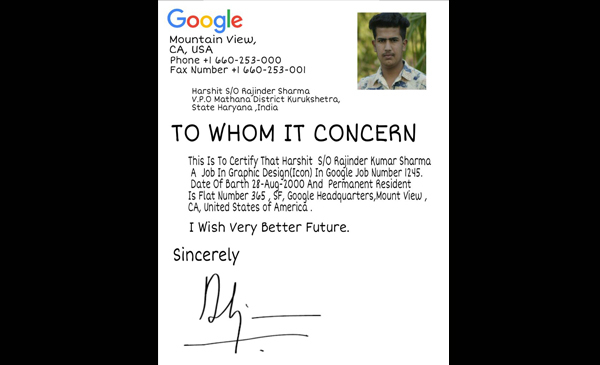 Harshit Sharma, a Class 12 student from Chandigarh, went from hero to villain in a couple of days after widespread media reports that Sharma has been selected by Google for “graphic designing” and would fetch a monthly salary of Rs. 12 lakh, once his year long training was over. Harshit’s story that was given veracity by statements by his school and Chandigarh Administration went viral in India with several leading English and Hindi dailies running the story. However, even a cursory look at the fake Google offer letter accessed by BOOM should have set the school’s alarm bells ringing. Read more about the story here. A deluge of fake images are skewing public opinion on the conflict in Myanmar. 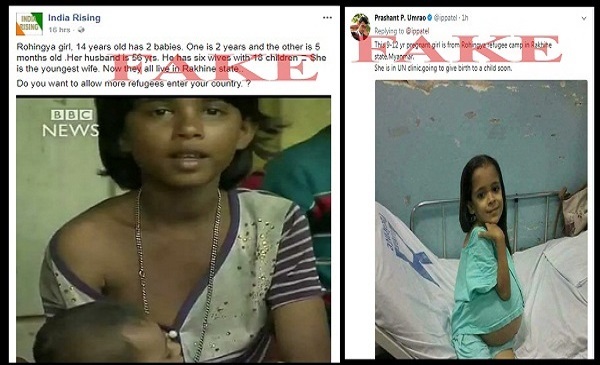 As the anti-Rohingya rhetoric on social media in India grows, old images, images out of context and fake images are being used to spread the divisive propaganda. Narratives to portray Rohingya Muslims as either victims or perpetrators of violence has sowed distrust and is fuelling bigotry on both sides. Read more about it here and here. Barely 48 hours after firebrand journalist Gauri Lankesh was shot dead outside her home by unidentified assailants in Bengaluru, malicious messages about her religious faith and actual name started making the rounds of Twitter, Facebook and WhatsApp. However, those spreading the propaganda failed to realise that Gauri’s full name is ‘Gauri Lankesh’ and that her weekly publication was called ‘Gauri Lankesh Patrike’. Patrike like the Hindi word ‘Patrika’ means journal or paper in Kannada. Read the story here. 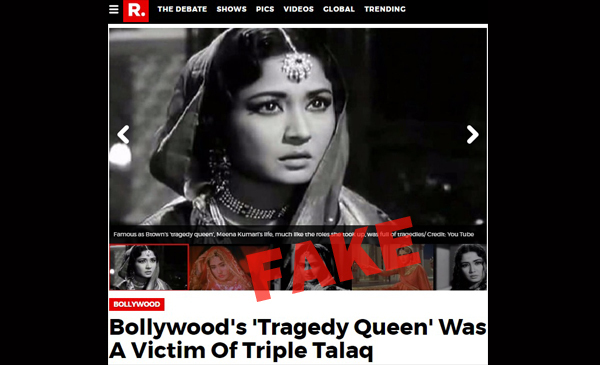 Several mainstream news publications including The Indian Express, DNA, Quint, India TV, WION and Republic among others reported a nearly identical fake account of Meena Kumari and Kamal Amrohi’s tumultuous marriage coming to an abrupt end when Amrohi supposedly said ‘talaq’ thrice. News articles about the actress being a victim of triple talaq are fake with the most damning piece of proof that her husband Kamal Amrohi belonged to the Shia community that does not practice instant triple talaq. Read the story here. 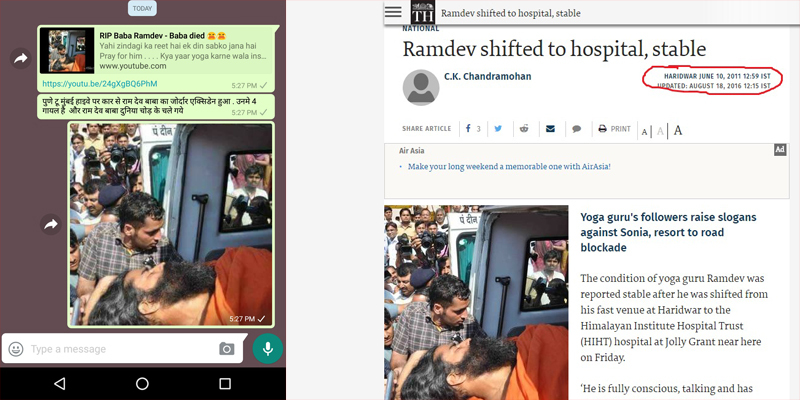 Several pictures of Baba Ramdev being carried on a stretcher and a mangled car went viral on WhatsApp groups in April. The text accompanying the pictures claimed that Baba Ramdev died in a serious expressway accident while he was on his way to Mumbai from Pune. However, a factcheck revealed that these separate images were very cleverly used to create a rumor of Ramdev’s death – either as an act of mischief or to promote someone’s YouTube channel. Read BOOM’s story here. 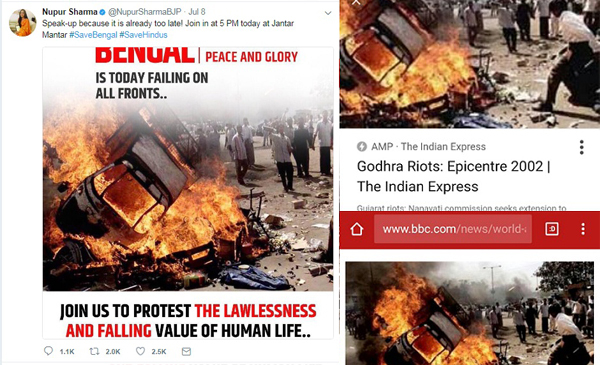 Republic’s Editor-in-chief Arnab Goswami was in news this year after an old video from 2013 showed him claiming that he and his crew were attacked “50 metres from a chief minister’s residence” while covering riots. 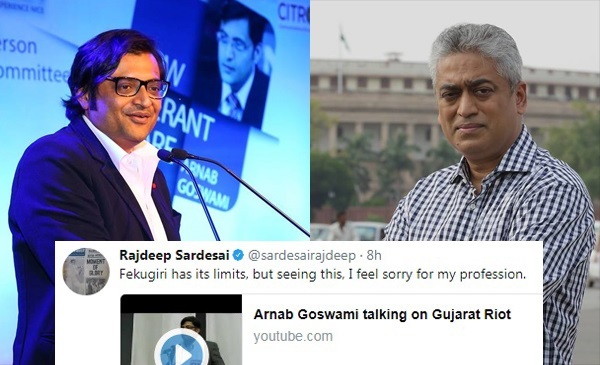 Goswami came under fire from his former editor Rajdeep Sardesai and ex-colleagues from NDTV as they accused him of lying as no such incident happened with him in 2002. Click here to read the story.